Posted on Monday, May 18th, 2015 by Innovate. The conference will be held at the Joint School of Nanoscience and Nanoengineering (JSSN). 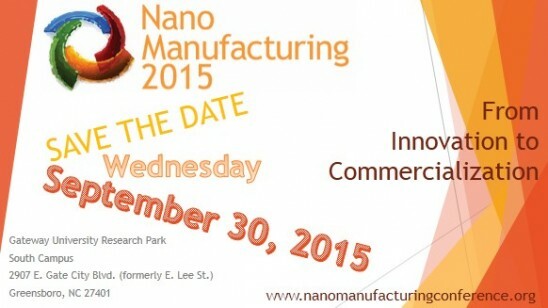 It provides an opportunity for Founders, CEOs, Senior Executives, Business Leaders, Economic Development, Education and Non-Profit Organizations to get together and share their vision concerning future of Nano Manufacturing. “This Conference is a real opportunity for those interested in learning more about advanced manufacturing technologies and how the application of these new technologies can help grow the manufacturing sector in North Carolina and the US”, said Joe Magno, Executive Director at The North Carolina Center of Innovation Network (COIN). Abstracts for the poster session need to be submitted by 8/30/2015. The best posters have the chance to win a prize.